Kakteen-Freunde 1: 123 -125, 1932; Werderm. in Fedde, Repert. Sonder-Beih. C. t.103 (1935); Backeb. in Backeb. & F. M. Knuth, Kaktus-ABC, 277, 416 (1935). Origin and Habitat: All varieties and forms referred ofRebutia senilis come from Argentina, Salta Province, especially from the higher parts of the Quebrada de Escoipe and adjacent areas. Description: Rebutia senilis is a popular form of the very variable Rebutia minuscula distinguished by longer, bristly, glassy, white spines and very showy, large flowers, usually orange or crimson, but also white, red, and yellow which project up and outward from the lower sides of the plant. A similar colour range is found in other species of the genus, making it particularly attractive. It was named by its general appearance, “senilis” is senile (old), which refers to the white colour of the spines that largely covers the stems. It is self-fertile and blooms generously. Remarks: The size and number of spines is greatly influenced by the conditions of culture, at lower light levels the spines are less numerous, delicate and whitish, while with strong solar radiation the spines are stronger. In some cases differences are referable to separate population, but often occurred over a long period of cultivation due to autogamy. Many such variants, including kesselringiana with yellow flowers and lilacino-rosea with lilac flowers have been described as species in the past as variety and forms, but often this “variety” are the result of confusion and misidentification. Habit: It is a small solitary or mound-forming cactus. It grows quite close to the ground and offsets only with age. It would appear that in cultivation they grow larger and cluster more vigorously than in habitat. It is a prolific bloomer. Stems:Stem globular, depressed, bright green, about 7 cm. high and the same across, with spirally arranged tubercles and densely covered by spines. Ribs: Spiralled with tubercles, approximate, in spiralled arrangement. Tubercles: Distinct low, rounded 2-3 mm tall. Areoles: Very small (1-2 mm Ø) on top of tubercles, circular to slightly elliptical, covered with abundant, long persisting, white wool, later bare. Spines: 30 to 40 bristly, ristle-like, translucent, glassy white, erect or spreading, hardly distinguishable as radials or centrals, 5-30 mm long. Flowers: Flowers grow in profusion from the older areoles on the bottom half of the stem, often at the stem bases. Funnel-form, usually orange or crimson (but also white, red, and yellow), to 4 cm long about 3,5 cm wide. Ovary spherical, 3-4 mm wide, yellow-orange, covered with triangular, completely bare reddish-brown scales; floral tube funnel-shaped, 3-4 mm in diameter at the base, 10 mm wide at the top, whitish inside, outside light reddish, covered with longer, brownish pink, bare scales, tepals narrowly lanceolate, tapering to a long point, 18-25 mm long; filaments pale yellow, 8-12 mm long, whith yellow anthers, pistil and stigma whitish, stigmas lobes thread-like stretching across the highest anthers. Blooming season: The flowers appear in spring. Fruits: Globose, red, about 5-8 mm in diameter, yellowish-red, covered with bare, olive-brown scales, with a thin drying skin. Seeds: Oblong, glossy black 1,2 mm long and 0,8 mm wide, testa shiny, slightly bumpy; hilum white. 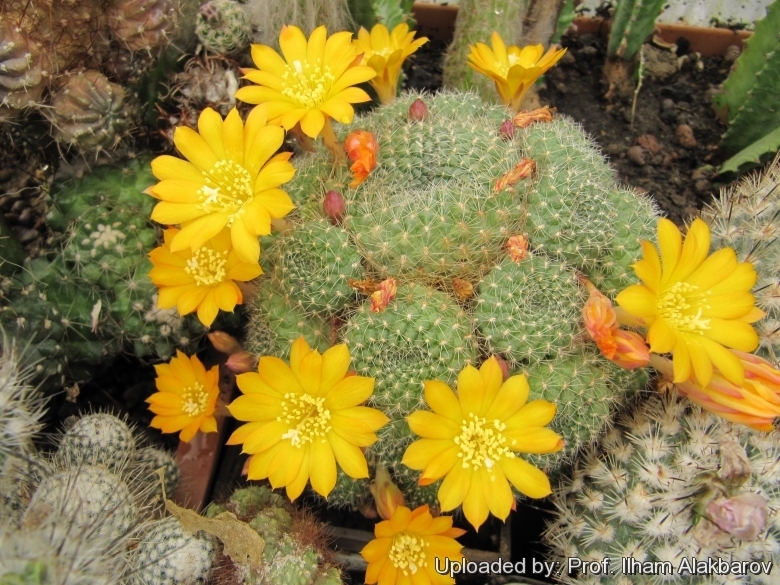 Cultivation and Propagation: Rebutia senilis is a free-flowering and easy plant to grow.